Categorise and bookmark any place - add comments and ratings too! 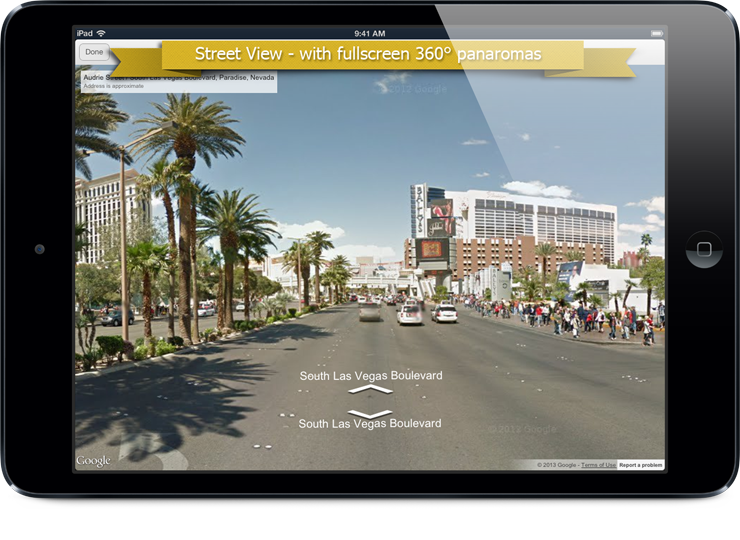 Beautiful fullscreen Street View on your iPad - with full 360 degree panoramas! Draw directly onto the map and share your creations! Maps Pro uses the official Google Maps SDK, which means you get high quality, fast, zoomable Google Maps for your iPad, with full retina display support. Maps Pro features full support for detailed scalable maps, complete with 3D buildings when zoomed in at the highest detail. Navigate using the standard iPad gestures - pinch to zoom and swipe with two fingers to view the map in 3D. Tap and hold to drop a marker on the map and see more details or to bookmark the location. Maps Pro includes an amazing full-screen Street View browser. Simply drag the Street View icon from the toolbar onto the map, and you'll see the street view of that location. Street View can also be automatically shown from any of your bookmarks or place searches. Maps Pro features driving, walking, cycling and transit directions, with up to three alternative routes shown. Simply enter your destination and an optional start location (if not starting from your current location) and your route will be calculated with full step by step instructions. For transit directions, you'll even see the departure and arrival time for each transit type. Can't remember the exact spelling of an address? Maps Pro features address auto-completion based on your current location, showing you the most popular results for the address as you type! 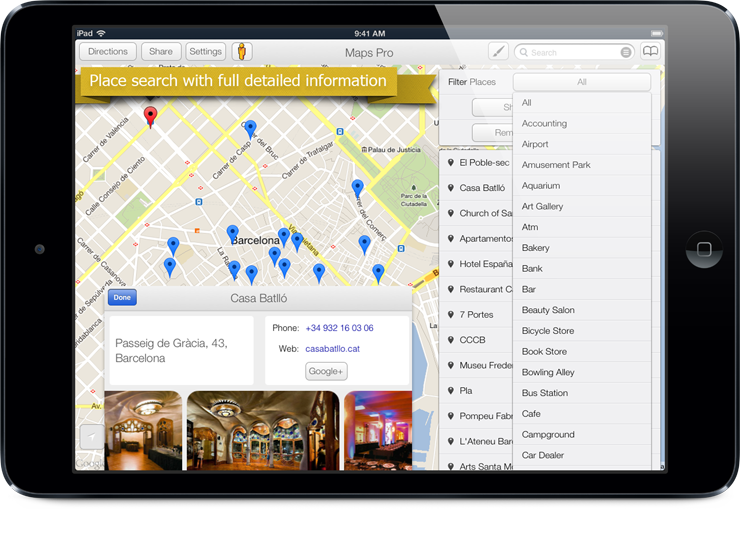 Maps Pro features an extensive categorised place search, letting you easily find nearby places. Want to find the nearest Thai restaurant? Or the closest car park? Maps Pro lets you find what you need, and shows all of the results on the map. After finding a place, you can easily get full contact details, web site details, reviews and photos. 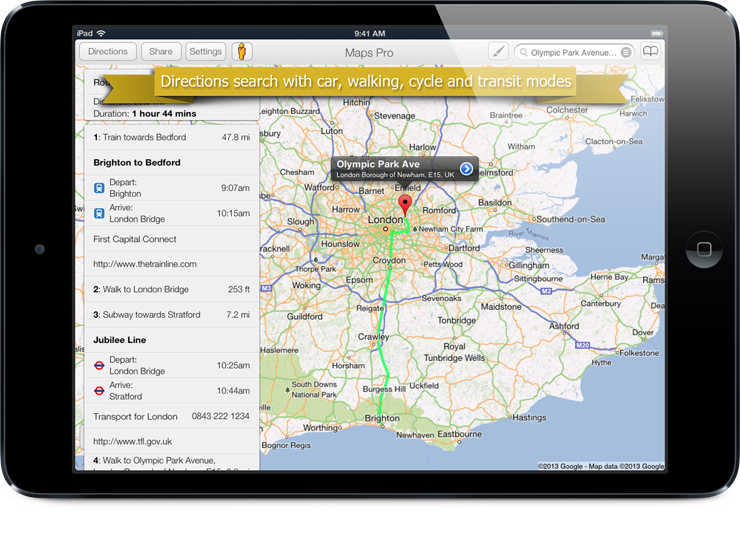 Maps Pro even integrates with Skype, letting you call the place directly from your iPad. Maps Pro lets you not only bookmark your favourite places, but organise them efficiently too! Categorise your bookmarks, and easily add new categories as you need. Not only that, but ratings and comments can be added to your bookmarks, letting you easily find your favourite places. Your contacts can also imported into Maps Pro (once you authorise Maps Pro to do so), letting you easily find any location from your Address book. Maps can easily be shared with your friends - just hit the Share Map button either from the toolbar or the place information popup and you can send full details of the current place or your current address along with a link and a full picture of the map. 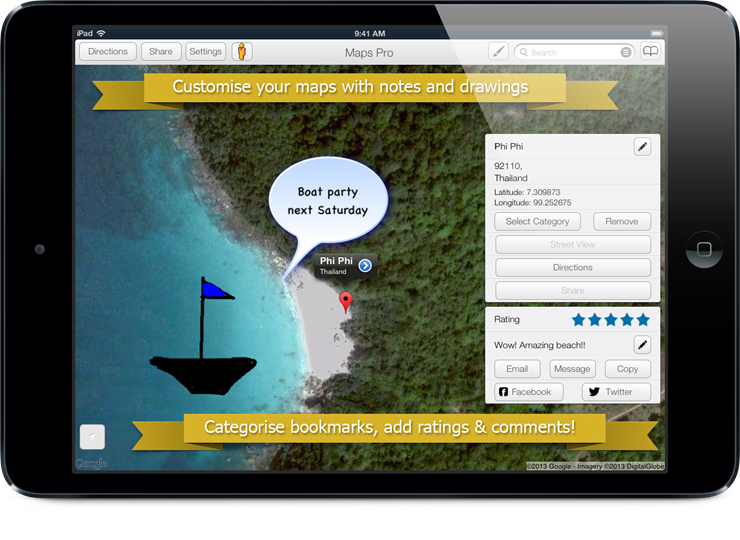 Maps Pro lets you add annotations directly to the map - add comments, arrows and other pictures directly to the map. Or, if you want to get creative, hit the pencil icon and draw directly onto the map. Your creations aren't just temporary - they become part of the map itself.